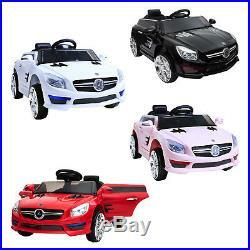 Kids 12V Dual Motor Battery Powered Mercedes SLK Sports Style Ride On Car. If you only want the best for your kids, why not get the Ride On C Class? This amazing remote control car is so stylish and incredibly close to the real thing. In fact, it is so realistic it even has a seat belts and open able doors. This ride on car will keep your kids entertained for hours. You can use the parental remote control so you can control this car remotely, whilst your child rides in the car. It will also allow you as the parent to override the child's control, putting you firmly in the driving seat without actually sitting in it! Optional parental remote control - The ride on car can be used with the normal in-car controls, using the pedal with the forwards/reverse gears and steering wheel, or can optionally be used remotely with the parental control. The parental radio remote can operate from up to around 20m away and controls forwards/reverse and moves the steering wheel left and right. MP3 player input with volume control - This electric car comes with a cable which plugs in to the dashboard, allowing an MP3 player or any other device with a headphones socket to be plugged in, and the music played through the car speaker. Plugging in a device disables the in-car sounds. Steering wheel sounds - The steering wheel buttons include horn and sounds. Seat belt - This kids' car has a seat belt fitted, to keep your child safe if using the parental remote option. Working lights - The front headlights and rear light, both can be switched on. Battery indicator - It has a battery capacity indicator, you will know how much power the battery has got and monitor the battery if it needs a charge. Per installed MP3 music, FM radio and USB connection. Working Head & Rear Lights. Dimensions:88 x 58 x 39cm. Ride Time: Around 1hour depending on kid's weight and surface. Suitable for children aged 3-8 years depending on child's size. What's in the box. SBT Hobbies was founded in 2005, we are based in Gosport, Hampshire. We specialise in kids ride on cars, remote control toys and photography products. We understand communication before and after a sale is very important so we aim to respond to all messages within only a few hours. We import all products into the UK ourselves so we can offer our customers the very best prices and product support! For larger, heavier or multiple items we use a Parcelforce. Any damaged goods must be reported within 72 hours of the order being delivered. The courier will refuse any claims submitted after 72 hours. We are specialist for Kids Ride on Cars, Remote Control Toys and Photography Products and so on. We also provide the best customer service as we can, we understand communication is very important before and after sales so any message will be replied within few hours. All members of SBT Hobbies wish you would enjoy the product we supplied and the customer service we provided. For larger, heavier or multiple items we use courier service. Receiving a damaged goods must be reported within 72H to us after the goods was delivered. The courier will refuse any damaging claim after 72H. We will not take responsibility to replace or exchanging the goods. Add Our Shop to your Favourites to receive newsletters about new items & special promotions! The item "12V Battery Mercedes SLK Style Electric Kids Ride On Car Parental Control" is in sale since Sunday, February 18, 2018. This item is in the category "Toys & Games\Outdoor Toys & Activities\Ride-on Cars\Electric & Battery Powered". The seller is "1234-click" and is located in Gosport UK. This item can be shipped to United Kingdom.